During the height of a harsh Vermont winter, the body of a woman is found hanging from the steel-mesh retaining net lining the cliffs along the interstate. She was brutally murdered, with the word "dyke" carved into her chest. She was also a state senator and best friend and ally of the current governor, Gail Zigman. At Zigman's personal request, Joe Gunther and his Vermont Bureau of Investigation team agree to help the Vermont State Police in their investigation before the victim's high profile and powerful friends create the inevitable publicity maelstrom. Raffner was indeed a lesbian, and the word carved into her chest might be evidence of a hate crime, or it might be a feint designed to confuse and mislead investigators. But the question remains-what was she involved with, who wanted her dead, and what company was she keeping? What Gunther and his team discover during their initial investigation isn't the stuff of a simple murder. Someone killed a prominent figure and fabricated an elaborate scene for a purpose. 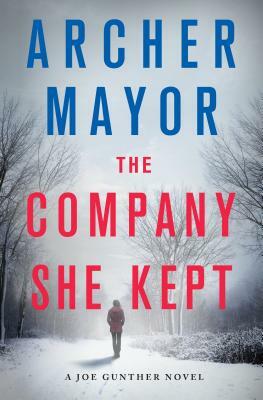 And this might only be the beginning...in Archer Mayor's The Company She Kept. ARCHER MAYOR, in addition to writing the New York Times bestselling Joe Gunther series, is a death investigator for the state medical examiner, and has twenty-five years of experience as a firefighter/EMT. He lives near Brattleboro, Vermont.